The 16 inches that fell on and near February 14 were peculiarly tough on motorists. By 1923 there were plenty of them and auto dealers too. Before the snow checked in, a large tent was raised at the corner of Fourth Avenue and Blanchard Street, a then still open site in the Denny Regrade. 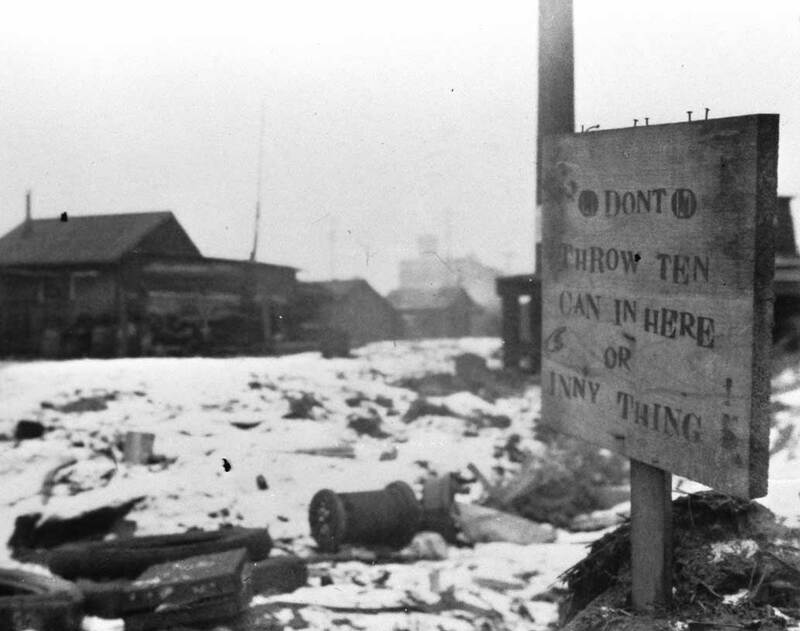 Contrary to the predictions for a prosperous new neighborhood that were proffered to promote the razing of Denny Hill early in the century, the new Denny Regrade still had many unimproved lots. Canvas was stretched above the corner for the year’s auto show. The Civic auditorium, later the favorite site for car shows, was still a few years from construction. With the visit of more than a foot of wet snow the tent sagged. On the chance of the big tent’s collapse the new cars were evacuated to avoid dents. The snow also slowed local streetcars to about half their normal speed, and the city’s fire chief asked locals to be both careful and patient especially in case of fire. In order to prevent slipping, he explained that fire horses would not be rushed beyond a safe pace to any emergency. Horses continued to be used in the department until the late 1920s. Little Green Lake, of course, has frozen over more often than Lake Union. 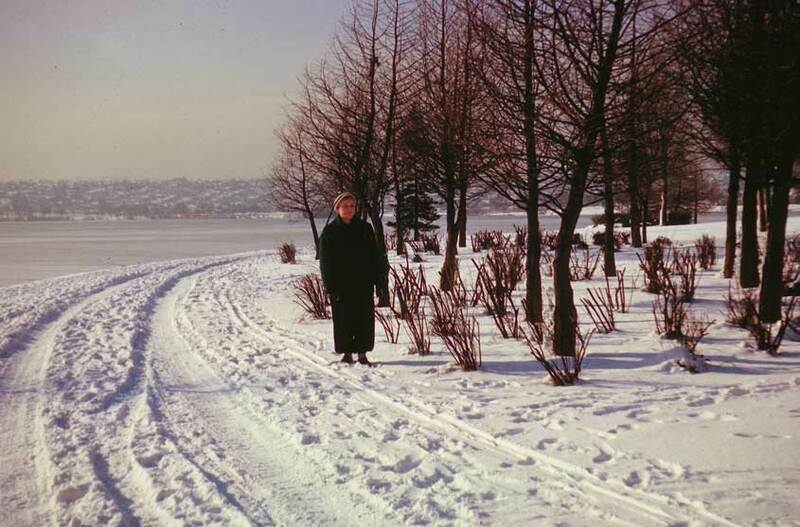 To the repeated joy of skaters who successfully scrounged for clamp-on skates, the lesser lake gave in to ice in both February 1929 and January 1930. Many skated past midnight. For warmth they visited the bonfires set in trashcans on the ice. 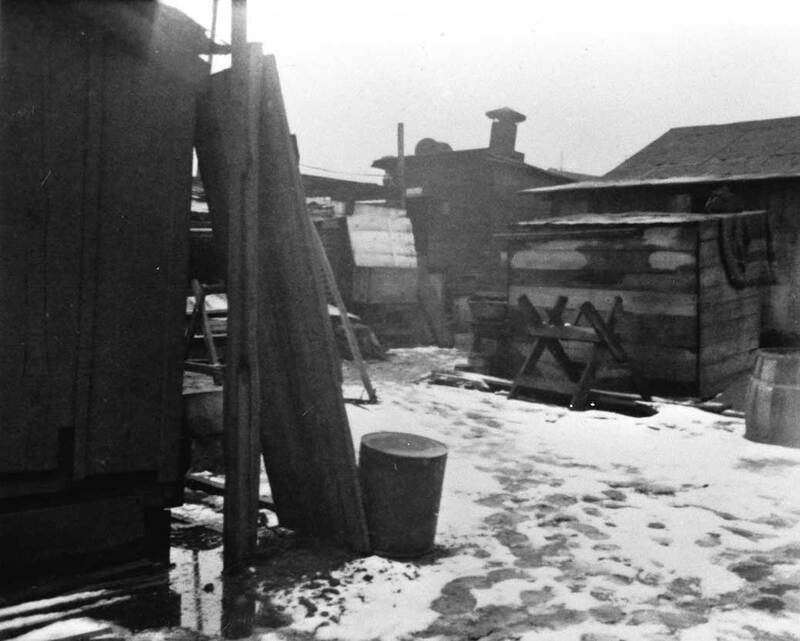 The January freeze occurred during the first year of the Great Depression when winter fires in trashcans became commonplace on vacant lots and in “Hoovervilles” as well. In a pattern that may indicate upward mobility in status rather than elevation this year the weather bureau moved from the Hoge Building at Second and Cherry to the new Federal Building at First and Madison. It was certainly a loss in elevation for the Hoge was the taller building. When the service first moved in the Hoge was the highest building in Seattle, climbing five stories higher than the Alaska Building, which was kitty korner from it. The Weather Service left the Alaska to take quarters in the taller Hoge. From this behavior one might have expected it to move into the Smith Tower when it was finished in 1914, but it did not. 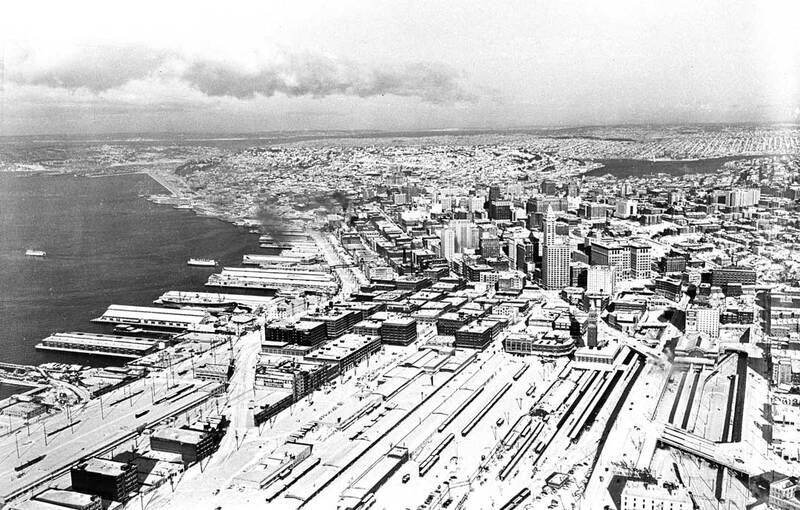 The two other distinguished quarters for the service’s first half-century were first, Pioneer Square’s Olympic Block at the southeast corner of First Avenue and Yesler Way, followed by the New York Block, another brick and stone home. It, like the Alaska and Hoge buildings, was built at the intersection of Second and Cherry, the northeast corner. 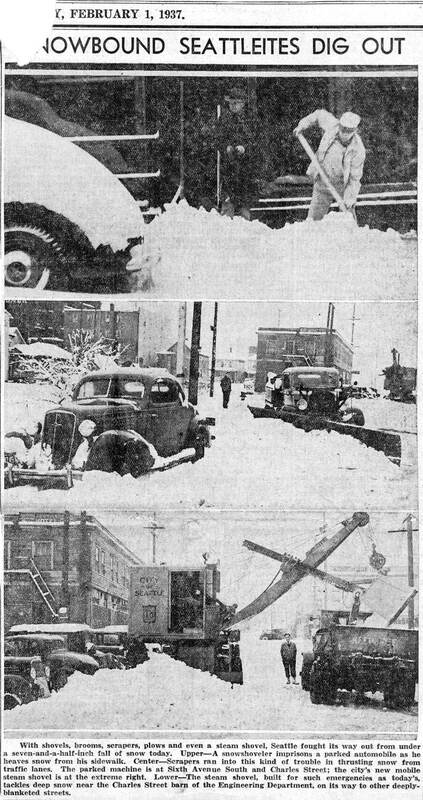 1933 was also a big year for winter weather – but not in Seattle. On Dec. 23, a United Airlines pilot, flying north form Portland, described western Washington as “almost one inland sea from Portland to Seattle.” Most of the damage from flooding rivers was done in Cowlitz County and the other eight southwest counties. The Yakima River basin was also inundated, the Snoqualmie Pass highway washed out, and valley towns Ellensburg, Yakima, Wapato, Toppenish, were flooded after levees failed. The Depression-time flood was an antidote to the old condition of everyone wanting flood protection but nobody willing to pay for it. Citizens gathered in “indignation meetings” and pressured the state and federal governments to come forward with flood planning, control, and relief. The protests led to substantial changes. This is not about snow. In the 46 years since the Weather Bureau began keeping local records it had never rained on the 27th of July, until this year, 1937, and then promptly the skies went dry again for nine more July 27ths. But with its return in 1947 the rain began a July 27 run that would have tempted any gambler, for it fell on that day also in 1948 and 1949. This is the kind of meteorological trivia that excites fans of forecasting and although it is hardly registered by anyone else, we are happy to note it here as a service to others among us who like we are also easily amused. And this is about snow. 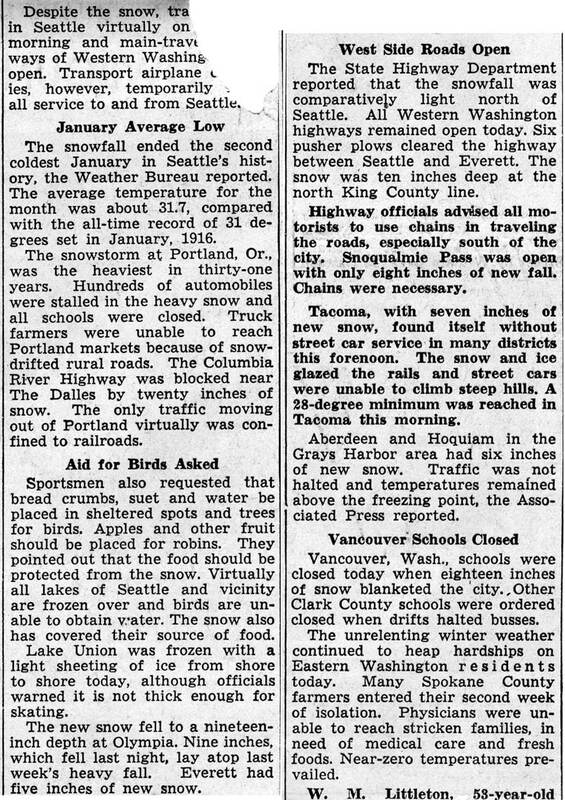 A recently found (Jan 22, 2010) clipping reveals that there was a substantial Seattle snow on Feb. 1, 1937. However, a quick reading of this blogaddendum clipping will reveal that our snow did not nearly reach the depths of Portlands. Most likely the above and below are from the afternoon paper, The Seattle Times. 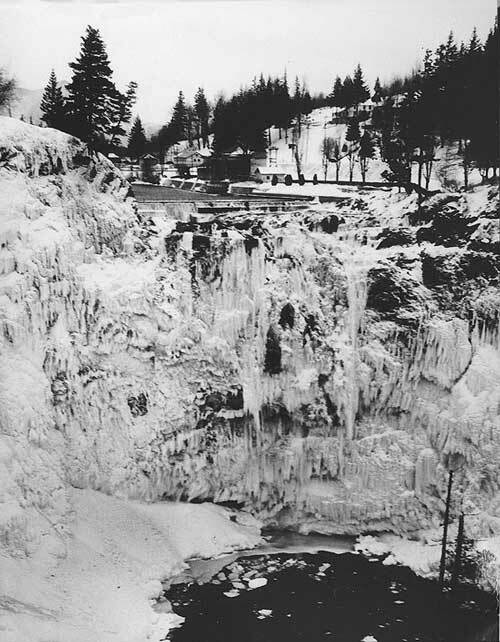 For many experienced locals the snow of Jan. 20, 1943 brought to mind – but briefly – the snows of 1923 and 1916. We might also compare it to our recent Big Snow of 2008. However, unlike ours, in 1943 there was nothing like the anxious anticipation and post-snow scolding we heard with our last big one. In fact the snow fell so softly in 1943 it was hardly heard. But not a word of this was decoded with ordinary language on the chance that the enemy might be listening or reading and somehow steal our textbooks and towels. 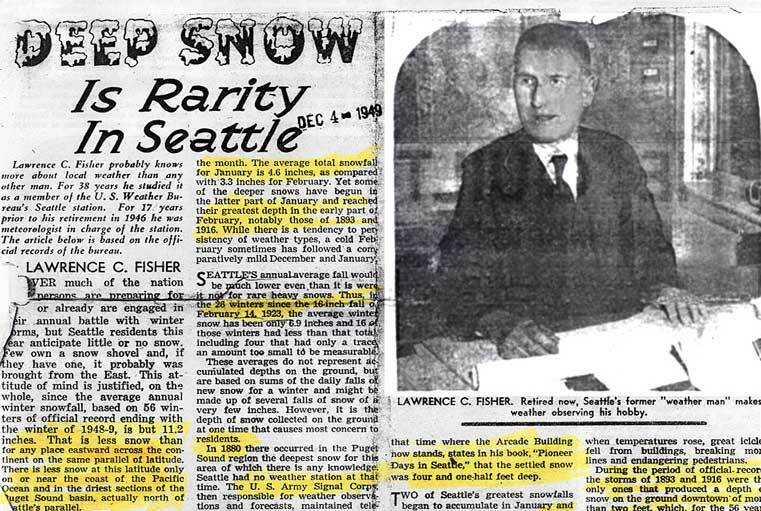 In 1949 it occurred to Lawrence C. Fisher, a 38 year Seattle veteran of the Weather Service, that he could relax and celebrate. There was, indeed, thought Fisher, something wonderful about our meteorological moderation. Through 56 winters of official records our annual snowfall was on average not high enough to bury a ruler: 11.2 inches. Six winters in those 56 had no measurable snowfall, only traces, and since 16 inches dropped on the auto show in Belltown in 1923, the average winter snow had been only 6.9 inches. Had Fisher waited a year to make his report he would have substituted great surprise for contentment. Or perhaps the Times would not have printed it anytime soon after January 13, 1950, a Friday. 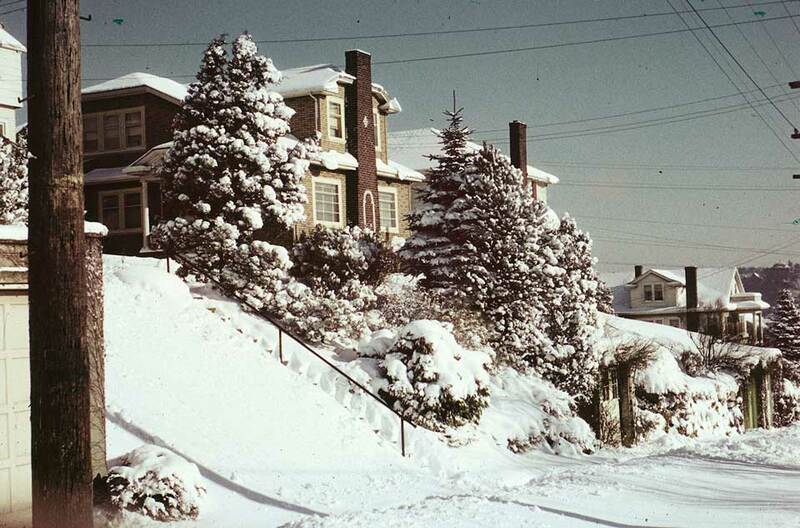 The challenge of driving on Queen Anne Hill through the Big Snow of 1950. 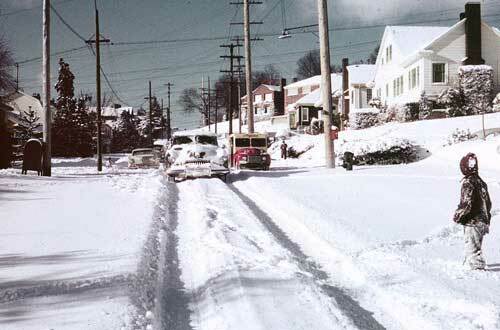 This slide by Seattle Camera Club member Horace Sykes looks west on Prospect Street through its intersection with Nob Hill Avenue N.
If we rate a snowstorm not so much by its depth but by how it is delivered – or driven – then we can introduce the blizzard of 1950 as both large and memorable. It was also an ironic reversal to meteorologist Fisher’s 1949 sermon on moderation, although he may have smartly cited it as the “surprising exception” that proved his rule. 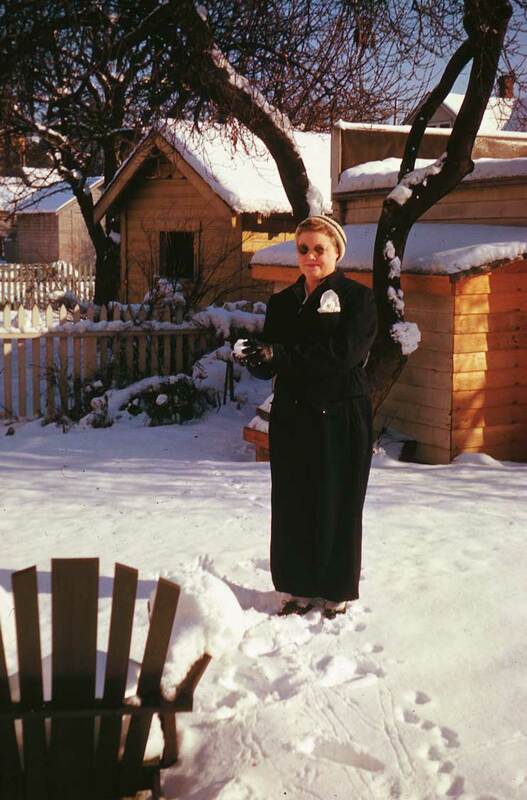 January 1950 was colder even than the first month of 1916. As if delivered by superstition, the blizzard clattered in from the ocean on Friday the Thirteenth. The howling continued through the night and into Saturday while the temperature dropped to 11 degrees. 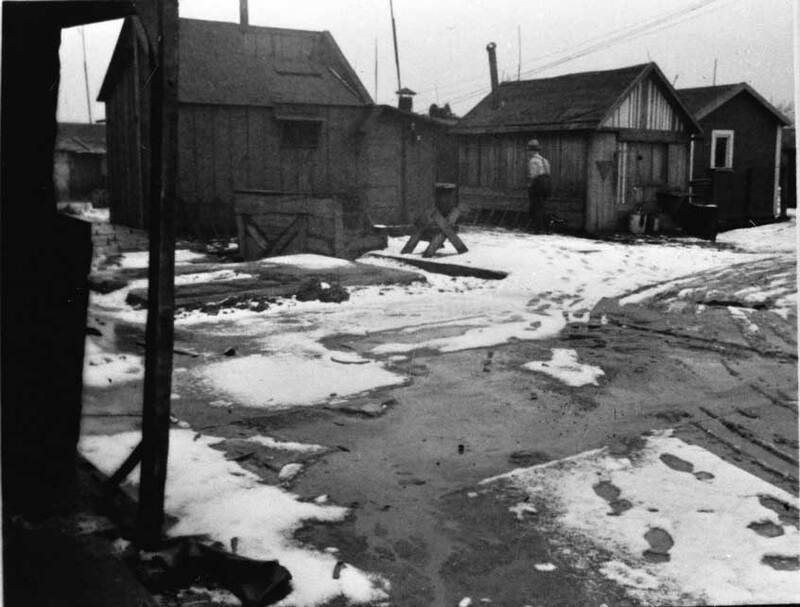 The waters of Elliott Bay were lifted by the winds and covered the wharves with a frozen salt-water frosting. Supervising district forecaster Tom Jermin tried to settle the hysteria. “Extremes bob up every so often. They always cause people to worry about the climate’s changing. We should remember that this is only the third extremely cold winter in 60 years.” The severity of the storm’s first day was grimly registered in the thirteen lives it carried off. But then in 1950 with a census enumeration of 465,000 living in Seattle there were more citizens available for a kidnapping storm. For four days in mid-January snow fell on the city for a total accumulation of 15.5 inches. It was almost moderation, but Seattle was temporarily snowbound. The heaviest day’s snowfall was 5.7 inches on the 17th. As it developed the year had two other shows visiting from above that were more effecting than the fifteen plus inches dropped in January. The year’s more mysterious visitors from on high has since been collectively named “the Windshield Pitting Epidemic of 1954.” The first reports came in late March and by mid-April there were thousands. 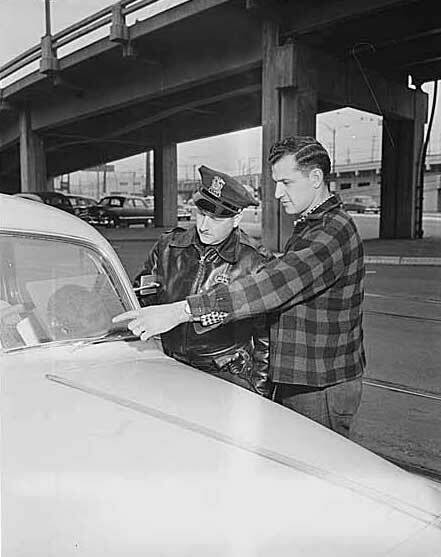 Puget Sound citizens began seeing dings or pits on their windshields, ones they were confident they had never seen – or noticed – before. Since these revelations were widespread – from Sumas to Centralia – a conspiracy of vandals seemed unlikely. A more scientific explanation was sought, perhaps, in cosmic rays, or particulates carried airborne by mysterious winds – although this last did not seem very scientific. Other theorists suggested organic causes, like sand-flea eggs hatching within the windshield glass. Part of the mystery was that these conditions were rarely found in rear windows. By April 15th, the day Marilyn Monroe revealed to the press that “Joe and I want a lot of little DiMaggios,” and the day the Army warned congress that Russia was stockpiling tasteless, odorless and colorless poisonous gases, and also the day that Washington State’s own Edward R. Murrow received a special Peabody Award just for “being himself” while standing up to Sen. Joseph McCarthy, Seattle Mayor Allen Pomeroy could not take it anymore, and wired both state Governor Arthur Langlie and President Dwight D. Eisenhower for relief in the windshield pitting emergency. Soon after Pomeroy made his appeal, several real scientists including members of the University of Washington’s environmental research laboratory (tenured professors who could claim guaranteed retirement benefits) quieted the masses by expressing their reasonable doubts and effectively reducing it to another episode of public hysteria. This science was magic. Within days reports of pitting were a thing of the past. During the blizzard of ’50, my father put us in front of the window — I remember it had a window seat — and said to take a good long look at the conditions outside because we would probably never see anything like it again around here. So far, so good. The excitement of the whole thing inspired him to walk from South Tacoma to Point Defiance to see the waves coming up in Commencement Bay. From a longtime fan going back to the Pacific Rotogravure columns and the “294 Glimpses of Historic SETTLE its Neighborhoods and Neighborhood Businesses.” I lived at 50th and Burke. On Jan 1, 1950 Dr McEvoy made a house call and determined my appendix had to come out very soon. He asked if there was a heater in our car. “Our car” was my 1930 Ford with no heater. He drove me to Cabrini Hospital in the snow. I only missed 3 days of school at Lincoln High. 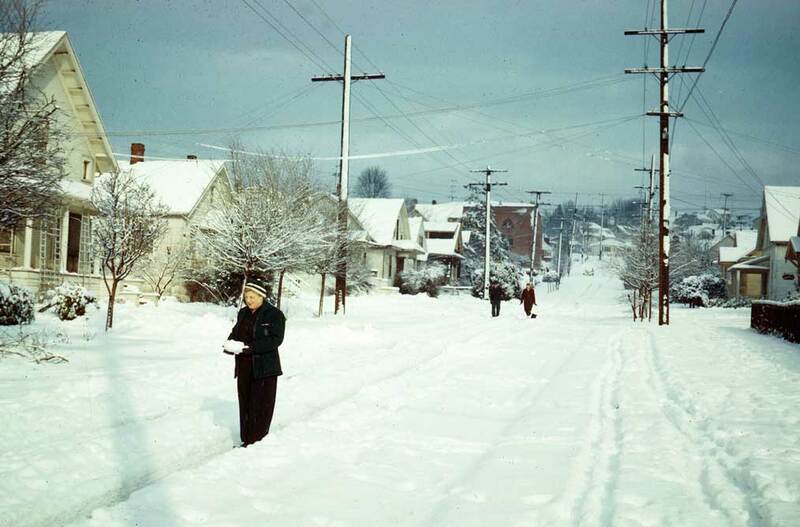 The big January 1950 snow left me with many memories. LIFE Magazine’s Special for January 1950 had just come out but it was many years later when I finally got a copy. Lincoln Class of ’50. Thanks for the memory Jay. 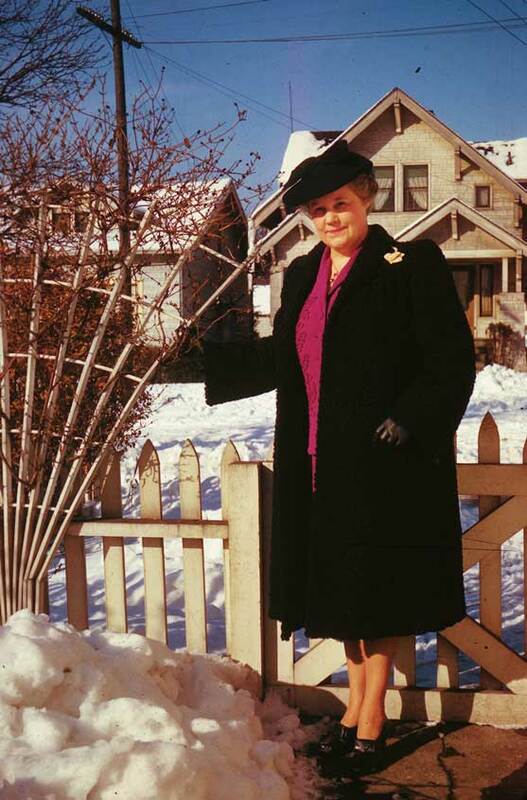 In 1950 I was still in Spokane delivering the morning newspaper and regularly pushing through deep snow with the paper bag about my neck.